Arthur Evans was so entranced by the Minoan palace at Knossos, Crete, that he spent 35 years excavating and reconstructing it between 1900 and 1935. He financed much of the work himself. Alas, I didn’t have as much time or money as he did, but I spent 4 hours ambling through the site, and felt deeply immersed in it, as though it holds timeless truths about living well. Why is it so appealing? 1. The palace at Knossos presides over the northern part of central Crete, and people called the Minoans built it. They had erected a palace there around 2000 BCE, but most construction was probably done from 1700 to 1450 BCE. Volcanic eruptions or earthquakes probably destroyed much of it around 1700 and the time between 1570 and 1500, but the Minoans kept restoring it. 2. The Minoans were probably non-Greeks who spoke a language not in the Indo-European family that Greek, Latin, English and Sanskrit are from. 3. They developed a system of hieroglyphic writing at first, and then adapted it into a new script called Linear A. They used this until a Greek society from the mainland imported its script to Knossos between 1500 and 1400. Linear A hasn’t yet been deciphered, but it seems to have been used mainly in palaces to catalog stores of produce and crafted goods kept in their storerooms. The Minoans didn’t compose long literary works, like the Homeric epics, or Hesiod’s cosmology with all the gods in their proper places. 4. 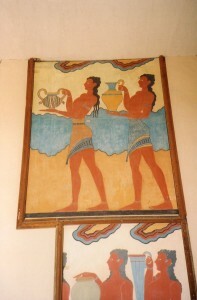 The Minoans’ storerooms were many. More than 20 long chambers sprawl around the palace at Knossos, and they held huge pithoi (jars) of wine, grain and oil, and probably many imported goods. 5. Several other palaces grace Crete, including Phaistos in the south and Mallia on the northern coast, east of Knossos. They also had many storerooms. 6. The Minoans didn’t fortify their palaces and don’t seem to have had a standing army. They had a strong navy that defended them from foreign invasions for 500 years, but they enjoyed domestic peace. The art that we have from them shows little violence. What a difference from the Greeks who would later preside there. The Minoans preferred to make wealth, not war–like the Nabateans who built Petra. They traded with Egypt, many Greek islands, the Greek mainland and societies in Turkey. Evans was enchanted by what he considered an innocent society at the dawn of Western civilization that gave us a model for living well. While lingering at the site, I found it hard to disagree with him. We’ll explore it more deeply in Facts and Maybes About the Minoans and the Palace at Knossos, Part Two.